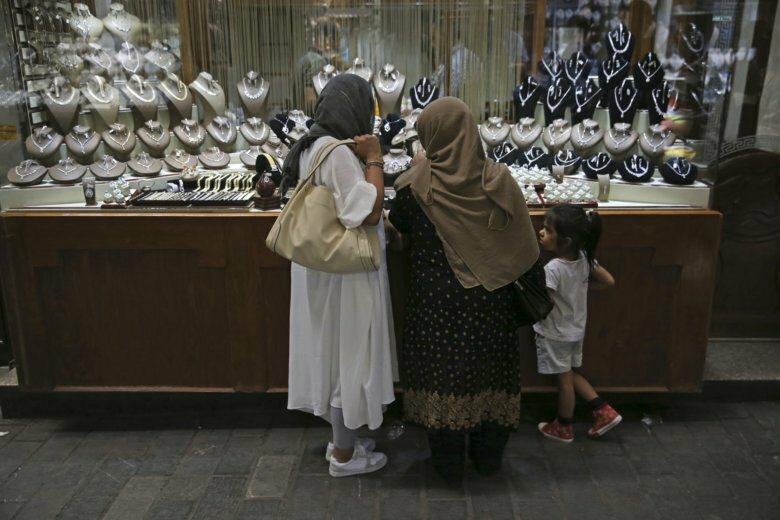 TEHRAN, Iran (AP) — Just one shop among the thousands in Tehran’s sprawling Grand Bazaar can offer a tableau of the darkening mood descending across Iran as American sanctions again take hold. A salesman who wants to move to Europe for a better life shows off his pots and pans to a mother now struggling to pay for the gifts she wanted before her daughter’s marriage amid the collapse of Iran’s rial currency. Another salesman loudly blames internal politics and corruption for the country’s woes. Muttered curses and even shouts against the government follow the journalists talking to them. For centuries, Iran’s bazaar has been the beating heart of both its economic and political life. While some now go to the Western-style mega-malls of Tehran’s tony northern suburbs, the Grand Bazaar’s narrow alleys, cramped stalls and wandering musicians still draw crowds of thousands. Strikes in Iran’s bazaar also have served as political bellwethers. Bazaar families opposed the Iranian Shah Mohammad Reza Pahlavi and supported the 1979 Islamic Revolution that saw him replaced by the Shiite theocracy and elected officials. More recently in June, protesters swarmed Tehran’s Grand Bazaar and forced shopkeepers to close their stalls, apparently in anger over the rial dropping to 90,000 to the U.S. dollar on the black market despite government attempts to control the currency rate. The rial in the meantime has dropped as much as 150,000 to $1 with many anticipating further drops as the U.S. restores punishing sanctions on Iran’s crucial oil industry in early November. The Trump administration denies it is seeking to overthrow Iran’s government through the economic pressure, though Iranian officials say the link between the two is clear. “For someone like me, a young man, if I’m hungry and I don’t have a job I’ll turn into a thief. I’ll turn into a vampire,” he warned. Asked what caused the economic woes, Mohammadzadeh blamed Iran’s costly foreign intervention in Syria.